Should Play-in-Editor automatically give mouse control to the game on PIE start (default = false). Whether to show a label for mouse control gestures in the PIE view. Location on screen to anchor the mouse control label when in PIE mode. The width of the new view port window in pixels (0 = use the desktop's screen resolution). The height of the new view port window in pixels (0 = use the desktop's screen resolution). The position of the new view port window on the screen in pixels. Whether the new window should be centered on the screen. The width of the standalone game window in pixels (0 = use the desktop's screen resolution). The height of the standalone game window in pixels (0 = use the desktop's screen resolution). Extra parameters to be include as part of the command line for the standalone game. The editor and listen server count as players, a dedicated server will not. Clients make up the remainder. Additional options that will be passed to the server as URL parameters, in the format ?bIsLanMatch=1?listen - any additional command line switches should be passed in the Command Line Arguments field below. If checked, a separate dedicated server will be launched. Otherwise the first player will act as a listen server that all other players connect to. 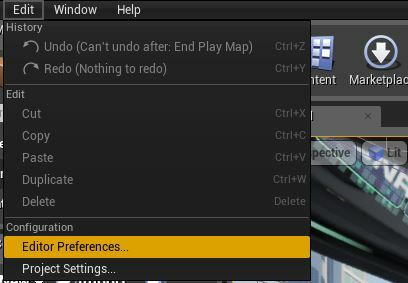 When running multiple player windows in a single process, this option determines how the game pad input gets routed. If unchecked (default) then the 1st game pad is attached to the 1st window, 2nd to the 2nd window, and so on. If it is checked, the 1st game pad goes the 2nd window. The 1st window can then be controlled by keyboard/mouse, which is convenient if two people are testing on the same computer. Spawn multiple player windows in a single instance of [API:UE4] . This will load much faster, but has potential to have more issues.